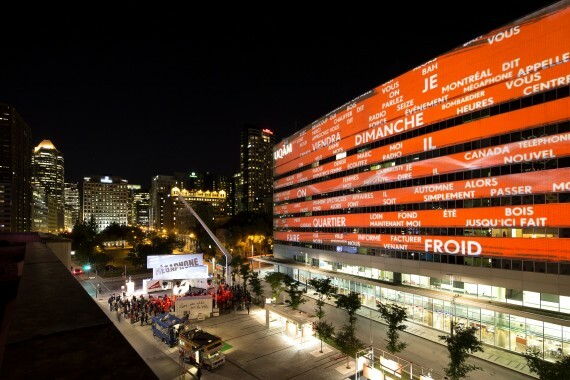 In September 2012, the National Film Board of Canada (NFB) and the Quartier des Spectacles announced that Megaphone, a project imagined by Moment Factory, had been chosen following a call for ideas sent out in April 2012. Artists, collectives and production companies from all fields had been invited to submit a proposal for an interactive installation that would spark reflection on how to reconcile the individual and the group. In addition to its unique character and plastic qualities , Megaphone seduced the jury with its urban and polemical spirit, and its potential to give anonymous urban dwellers an opportunity to shine by allowing them to speak out in a public space. The project engendered a wealth of ideas and knowledge, and the creative team sought to ensure that the technology used would generate imagery that matched the words being spoken . The Megaphone project inspired visual artists to push the limits of vocal recognition technology—which is still in its infancy—in order to find creative ways of representing multiple voices and images, all while ensuring both artistic cohesion and the success of an experiment premised on the interaction between human beings and machines. As we are at the beginning of the project, it’s still difficult to measure its impact. But so far, we can say that the reaction has been extremely positive. We have amazing press coverage, and every night a lot of people come to the installation. It’s a privilege to hear citizens passionately share their thoughts on the pressing issues of the day, such as the destruction of the planet (all while cursing drivers in their vicinity! ), the integration of individuals with disabilities into society, and the importance of human solidarity. The issues raised every evening travel as far as the Megaphone echo will carry them. Over the next few months, against the backdrop of city elections, the project will provide Montrealers with a map of the ideas coursing through their city. The speaker’s words are transferred to a voice-recognition system specially developed for Megaphone by the Centre de recherche informatique de Montréal (CRIM). This unique system takes spoken words and transcribes them in delayed time. The words are then used to build a visual space. 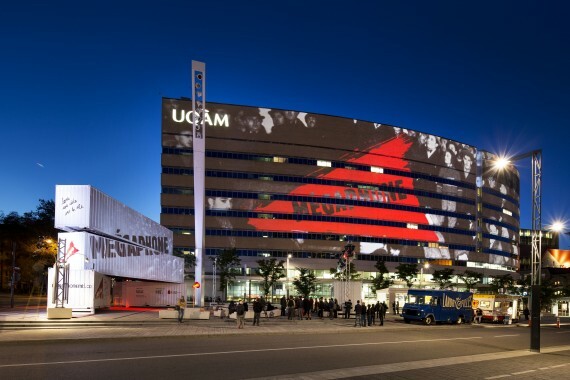 Added to a data bank, they become part of visual content that is projected onto the building while nobody is using the Megaphone. This provides both a reflection of the speeches and an overall picture of the statements recorded by the apparatus. The speech-recognition system designed by CRIM uses recent research on topics such as neuronal networks to treat speech sounds. Linguistic models specifically developed for Québécois French and Canadian English support highly accurate transcriptions of both languages.